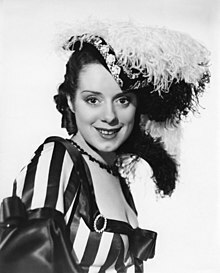 Elsa Sullivan Lanchester (28 October 1902 – 26 December 1986) was an English actress in theatre, movies, and television. After World War I, she began performing in theatre and nightclubs. She met the actor Charles Laughton in 1927. They were married two years later. She began playing small roles in British movies. The couple moved to Hollywood. Lanchester played small movie roles. They became American citizens in 1950. She played the title character in Bride of Frankenstein (1935). She played supporting roles through the 1940s and 1950s. She was nominated for the Academy Award for Best Supporting Actress for Come to the Stable (1949) and Witness for the Prosecution (1957). Following Laughton's death in 1962, Lanchester resumed her career with appearances in such Disney films as Mary Poppins (1964), That Darn Cat! (1965) and Blackbeard's Ghost (1968). One of her last roles was in Murder By Death (1976). ↑ Obituary Variety, December 31, 1986. This page was last changed on 29 March 2014, at 11:48.